It’s official – we’re moving to Texas. It’s actually been official for a few weeks and things have been pretty crazy around here – hence the total lack of blogging. The movers come on Tuesday, and I’m totally unprepared. Luckily, they’re doing all the packing. Lucky for me, anyway. For them – not so lucky. I just hope the two new underbed storage containers I ordered from the Container Store show up in the next day or two so I can pack up the giant pile of folded fabric and quilt tops that’s on my sewing table right now. Basically, unpacking is going to be a NIGHTMARE because our house is packed to the gills and kind of a mess. 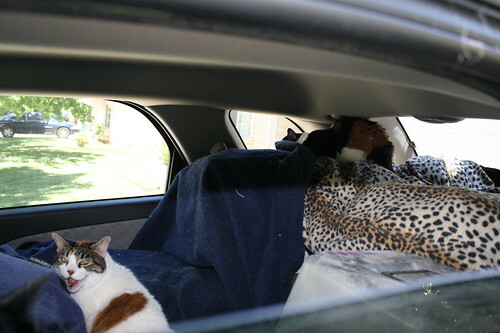 My husband already made the journey by car – SoCal to TX with FIVE cats in the car. 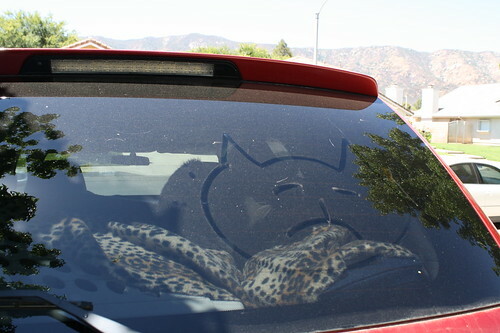 I had to sit in the car and roll down the window, and he’d put a cat in and I’d roll it up real quick. Otherwise they’d jump out. I’m really not sure how he made it. And after hiding in a hotel room for the last week – saying he only had two cats in there, he’s finally got a little apartment for us while we look for a house. TOO crazy. Here are some blurry, hectic photos of the great cat adventure. I think I remember my husband saying something about “those better not go on the internet!”…but it’s his own fault if he never bothers to read my blog. *evil laugh* They’re also his cats…so he made his bed. 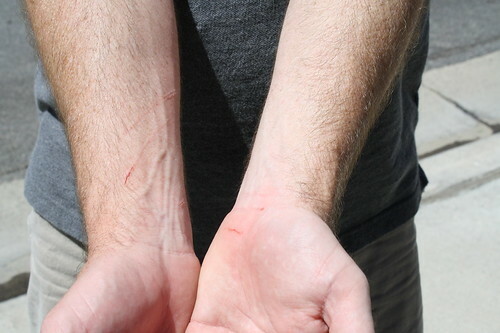 But they made it safe and sound, with only minimal lasting mental trauma and lots of scratches. So no animals were harmed in the making of these photos. Your husband is one brave man! 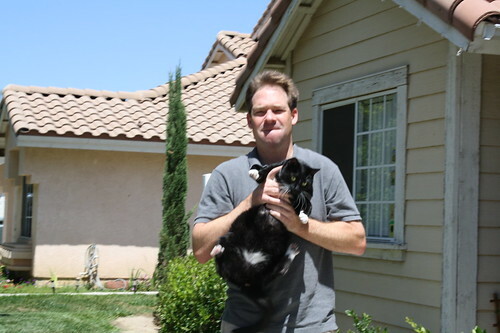 This post brings back a memory of when I helped a friend and her cats move. 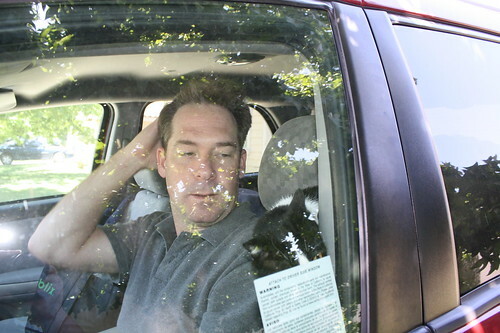 I Made my husband ride with the cat, his cat, when we drove here from Maryland. About an hour down the road, he pulls over, to guys leap from the truck practically hurling in disgust. A pillow was launched into the bed of the truck. Then I got “the Glare” when he caught me laughing. Right, because by myself with two dogs and an Infant was GREAT fun for me too. Atleast, he had a copilot. My Yorkie and Pitt-Mix would only fight over the front seat. Good Luck to you! You will be missed. My husband traveled with the cat to our new place too. She slept most of the way though. We did a lot of decluttering once we got to the new place. If we couldn’t find a place for it, we gave it to Goodwill. Good luck with the move. I know you’ll love Texas. i am so exited for you! i think you’ll really like texas — especially the high school kick lines you can go watch on friday nights!